"The only thing I knew to calm me down was to do art. I thought I would extend that to to my son who was going through treatment..."
My son, Amaey, was diagnosed with cancer in 2005. I used to be a creative director but quit my job to be a full-time caregiver. The very first year of treatment, kids are in and out of the hospital – more in than out. We spent so many hours shuttling from one place to the next that I felt that something was missing, especially with so much going on and the loss of control. The only thing I knew to calm me down was to do art. I thought I would extend that to to my son who was going through treatment and his brother who was three years older. We spent so many hours in the waiting room that we would do little projects here and there. Then we would be at home because he would end up being quarantined if there’s a cold going on outside, we’d have to stay home. We ended up doing a lot of fun art projects that brought about laughter and happiness. We forgot that everything else was going on in our lives. You spend so much time inside the hospitals that the families there become more your families than the world outside. I got to know all of the kids and parents that were in the waiting rooms. I don’t know how this happened, but they got involved in doing art with me. Since my background was in graphic design and my husband used to work at pixar, we knew a lot of artists. I thought – ‘wouldn’t it be fun to get a few artists to work with these kids and have some fun with art?’ In 2008, I did my very first workshop at pixar. We had 15 artists and 15 kids, we paired them up one-on-one. They had so much fun – it was magical. 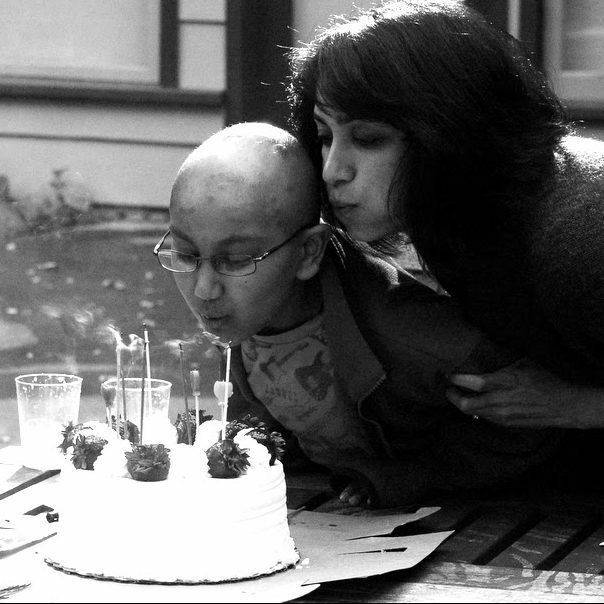 Purvi went on to start Kids & Art, a non-profit that hosts workshops and connects pediatric oncology patients with art therapy. Learn more at www.kidsandart.org.